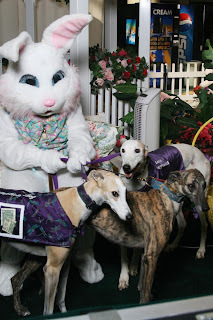 Seen at the Mall – Greyhounds and Rabbits! We always have interesting experiences when we do our meet and greets at the County Club Mall in Cumberland, Maryland. Our meet and greets are held in Center Court in the mall and that is where all the action usually takes place. Every month while we drive up to do our meet and greet event, we always wonder what new adventures we’ll experience. It was no exception last Saturday, March 26. When we arrived, there was a long line of people and children waiting to get photos with the Easter Bunny! We enjoyed watching the activity and laughed at the idea of our greyhounds and all the rabbits sharing space together at the mall. 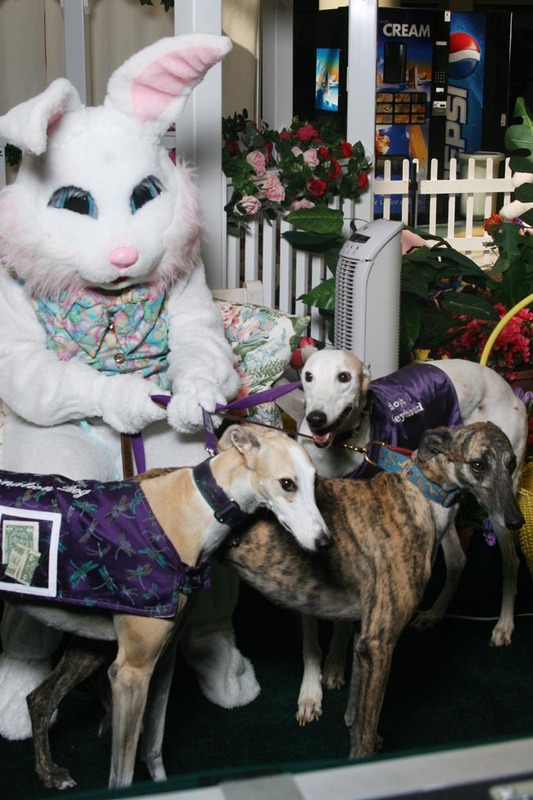 We decided to take the chance and we asked the photographer (and Easter Bunny) if they would mind taking a photo of our hounds with the bunny. They were more than happy to oblige! The photo above is what we got. We really enjoyed the day! We had a great time, the hounds got to get a lot of attention from the crowds, and we got this great photo!